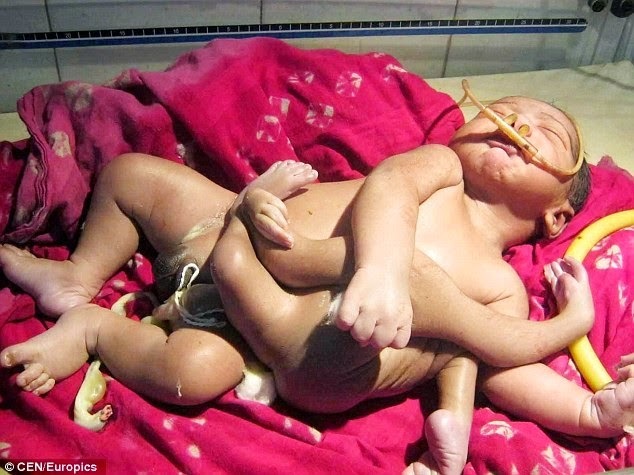 A baby boy born with four arms and four legs is causing some commotion in the streets of Baruipur, east India, as locals believe he is the reincarnation of a god. The child has been named God Boy, as multiple limbs are common among Hindu deities, and people are travelling from across the region to the city in West Bengal State to get a glimpse of the child. Local police complain they are struggling to control the crowds, as hundreds clamour to get access to the hospital. The family are overjoyed at their new addition and see him as the son Hindu God Brahma, who is depicted with eight limbs. 'When he first came out we couldn't believe it, the nurses said he was badly deformed but I could see that this was a sign from God. In fact, this is a miracle, its God's baby. Indian God's have extra limbs just like this,' a relative said.